You knew them as legumes: beans, chickpeas, lentils and peas. Technically, they’re pulses. Rich in both protein and fiber, they’re satisfying and nutritious and 2016 is the year to celebrate them. Here’s how. The United Nations has declared 2016 to be the International Year of Pulses, otherwise known as dried beans, chickpeas, lentils and peas. “Aren’t those legumes?” you ask. Technically “legume” refers to the whole plant, while “pulse” refers just to the dried seed. In other words, the part you actually eat. Pulses deserve their own year because they are good food. Beans and lentils are rich in both protein and fiber, which makes them not only unique, but also very satisfying, one reason why they help support a healthy weight. Plus, that fiber provides good food for our gut microbiota and helps protect against cardiovascular disease, type 2 diabetes and cancer. Pulses, which have been part of the human diet for more than 10,000 years, are an important part of some of the world’s best-researched, time-tested healthful diets, including the Mediterranean diet. Not surprising, considering how inexpensive and nutritious they are. Beans and lentils are rich in fiber and protein and low in fat and have a low glycemic index, which means they provide a slow, steady source of energy. They are a significant source of the minerals iron, zinc and magnesium, as well as folate and several other B vitamins. Have you heard that you should avoid beans and lentils because they contain phytic acid and lectins? Let me do a bit of debunking. Phytic acid is a phytonutrient found in beans, grains, nuts and seeds. While phytic acid can act as an “anti-nutrient” by binding to the minerals in beans, making them unavailable to you, it also has antioxidant and anti-inflammatory benefits. This is one reason why pulses can help protect against chronic disease. Soaking beans for 12 to 24 hours before cooking isn’t necessary from a culinary point of view, but it will degrade much of the phytic acid and make the minerals more available to your body. Lectins, a type of protein in beans and other plant foods, have caused some intestinal and other health issues in animals fed large amounts of raw legumes. In humans who eat cooked beans, lentils and peas as part of a varied diet, there’s no evidence of harm, a fact further supported by their long tradition as a staple food of some of the healthiest diets in the world. Cooking dried beans produces a bean with more texture and flavor than canned, but canned beans are still a handy pantry staple. The most common method is to soak the beans overnight. Then, discard the water, add fresh water, then simmer for 2 to 3 hours or until tender. Cook beans on the weekend when you have more time, in a slow cooker while you are at work (usually 6 to 8 hours on low), or in the evening for use the next day. Pressure cookers can dramatically slash bean-cooking time. Cook extra, because leftover beans freeze nicely. Lentils take much less time to cook, 30 minutes or so, depending on the variety. • Make hummus or other bean dips to serve with raw veggies or spread on a sandwich. • Use lentils, beans or a mixture of the two in delicious veggie patties and meatless meatballs. • Pureed cooked beans or lentils can be stirred into soups and stews to make them thicker, heartier and more nutrient- and fiber-rich. • Swap beans for potatoes or pasta in soups or stews. • Add black or pinto beans to breakfast tacos with eggs, salsa and avocado. • Make chili with more beans, less meat. 1. Spread lentils out on a baking sheet to look for and remove any rocks, then rinse in a fine-mesh strainer under cold running water. Place lentils, 2 cups water and a big pinch of salt in a medium saucepan. Bring to a boil, then cover and reduce heat to a simmer. Continue to simmer until lentils are soft but still hold their shape, 25-35 minutes. When done, drain off any excess liquid and transfer to a medium-large bowl. 2. While lentils are cooking, place bulgur wheat in a bowl and pour in 1 cup boiling water. Stir just to mix, then cover with a plate and allow water to be absorbed, about 20-30 minutes. Fluff with a fork and transfer to the bowl with the lentils. 3. Wash Tuscan kale and strip the leaves from the tough stems. Chop into fairly fine pieces. Rinse the bunch of parsley and shake dry. Chop the leaves and smaller stems the same size as the kale. 4. Wash the carrots and scallions and chop finely. Finely chop the walnuts (optional: toast them first). 5. 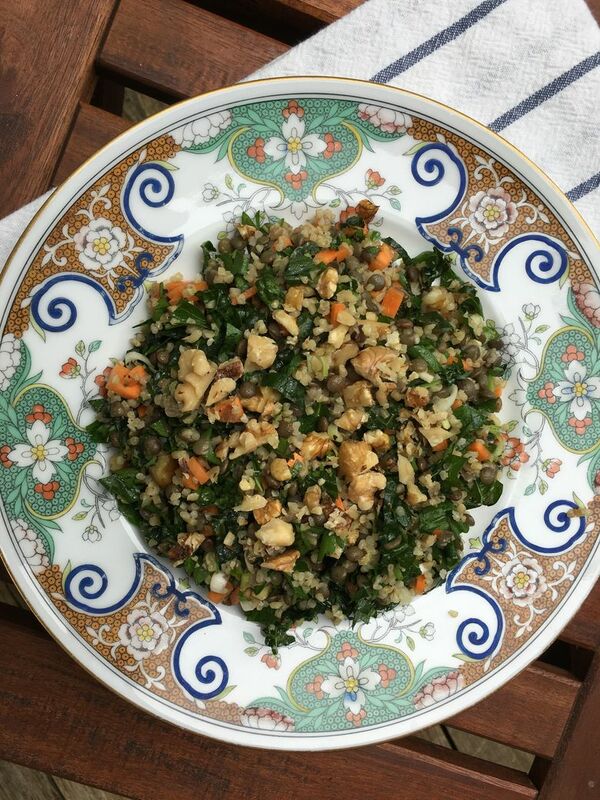 Add the kale, parsley, carrots, walnuts and lemon zest to the bowl with the lentils and bulgur. Gently mix to combine. 6. Zest one of the lemons. Juice both lemons and measure ½ cup into a liquid measuring cup. Add the ½ cup olive oil. 7. Peel and mince the garlic. Add to the measuring cup along with the teaspoon salt and the ½ teaspoon pepper. 8. Pour half the dressing over the salad and mix to combine. Allow to sit for about 10 minutes then taste. Add additional dressing, salt or pepper as desired. (Refrigerate any leftover dressing to use elsewhere).